Today I will be turning our attention back to the Mid-Volga region, to w hich i have dedicated several postings. This time i will be talking about the Tatars, a people unrelated to the others in the area. Here is our map of the Mid-Volga region. ﻿Tatarstan is shown in bright green in the middle right of this map. To the north, in yellow, lies Udmurtia, to the northwest, in red, lies Mari El, to the west, in royal blue lies Chuvashia, to the east in a sort of mauve color lies Bashkortostan, and to the south in pale green are Russian settled landx [with some communities of Moksha and Chuvash], then a bit further south is Kazakhstan, in teal. The capitol. of Tatarstan is Kazan', one of the largest and richest cities in the Russian Federation, and this is their flag. This area was the site of the Bulgar State from the 8th century untill the 1230's, when it fell to Batu Khan and the Golden Horde. His Kipchak settled in the area at that time, bringing their language, material culture and ethnonym of Tatar. After the decay of the Mongol Empire, the Kazan' Khanate was an independent state from 1438 to 1552, in which year they were conquered by the Russian Empire. They have remained under Russian and Soviet control since that time. Btw, the term 'Tartar' is considered offensive, being rather a pun made by Europeans with reference to 'Tartaros' Hades, in Greek. The proper term is 'Tatar'. There are many other local peoples who are called Tatars which live from Lithuania to China. 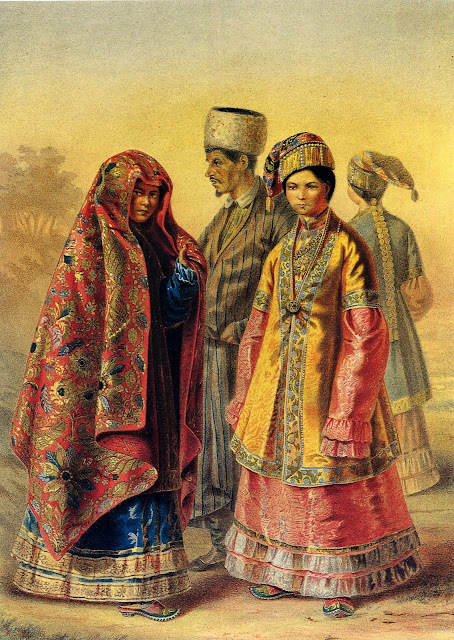 In this posting I am only going to cover the Costume and Embroidery of this community, the Kazan' Tatars. The question of how much of their ancestry is from the Kipchaks and how much from the Bulgars is apparantly controverted. 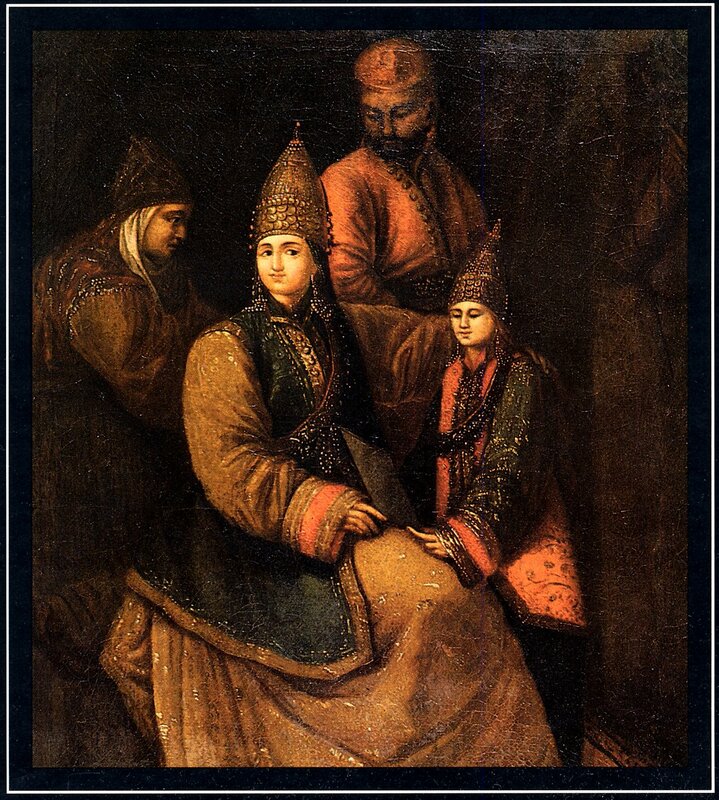 The costume of the Kazan' Tatars has changed suprisingly little over the centuries.This is a copy of a non-extant painting of the Tatar Queen Soyembika painted in the 17th cent. ﻿And here is a painting by our old friend Gustav Feodor Pauli which was published in 1862. As you can see, the costume is substantially the same in both paintings. It bears no resemblance to the costumes of their neighbors, the various Finnic peoples or the Chuvash. It rather resembles the costumes of central Asia.﻿ The basic garment of the woman can be described as a 'dress', In all of the sources which i have it is made of colored, often very rich cloth. 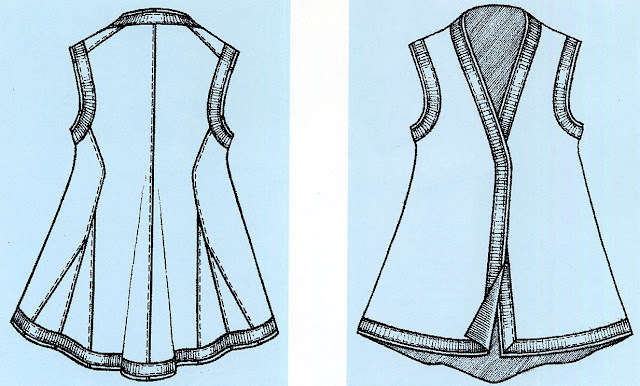 Details of the cut varied over the years, especially in the number and size of the ruffles sewn onto the bottom part. Here is the basic cut of the 'dress'. 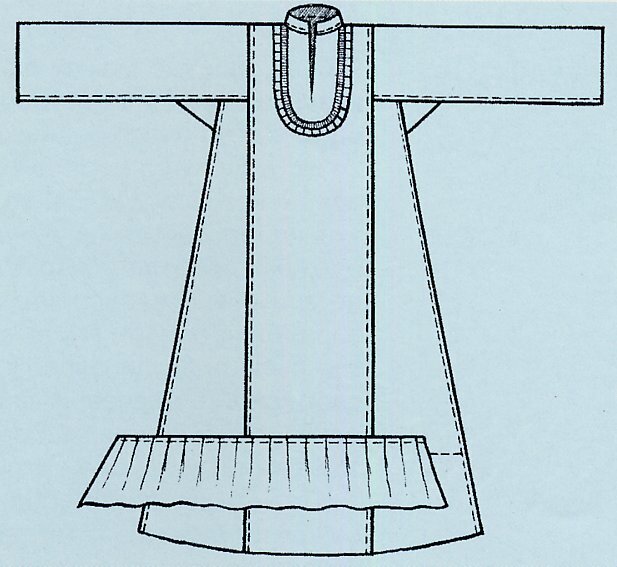 Salwar, [baggy pants], and possibly a linen uppergarment were worn under this, but they never show outwardly. This garment was always worn with a vest, 'kamzul', which varied from hip to knee length. here is the basic cut of the kamzul. This garment spread quite widely through eastern Europe. Along with this were worn a number of kinds of headgear, and an astonishing variety of jewelry. Here are a couple of examples, with long and short kamzul. The first of these two examples show the ensemble worn with a piece of chest jewelry known as '﻿yaka chylbyry'. 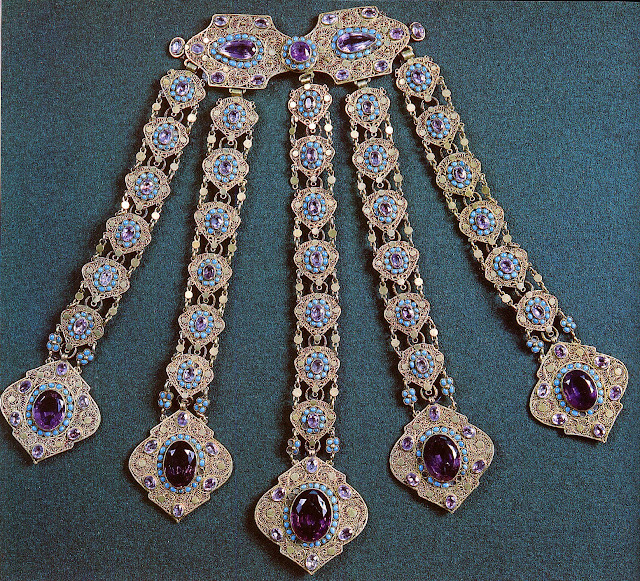 It is basically a collar pin with five pendant chains of fine metalwork set with stones. Here is a closeup view of one. 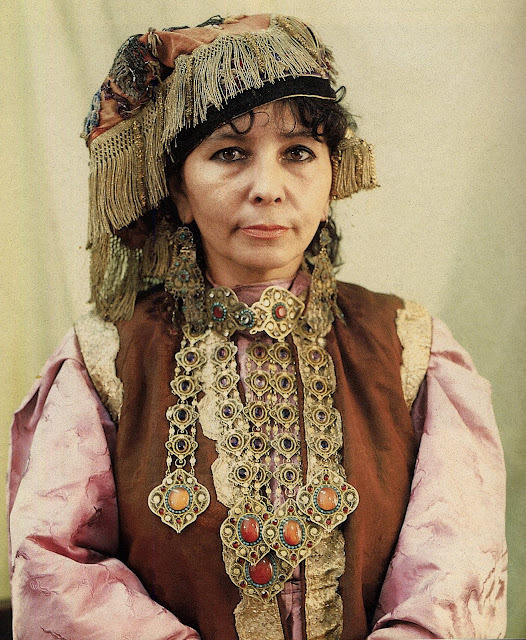 Here is a Tatar woman wearing a costume with the yaka chylbyry. 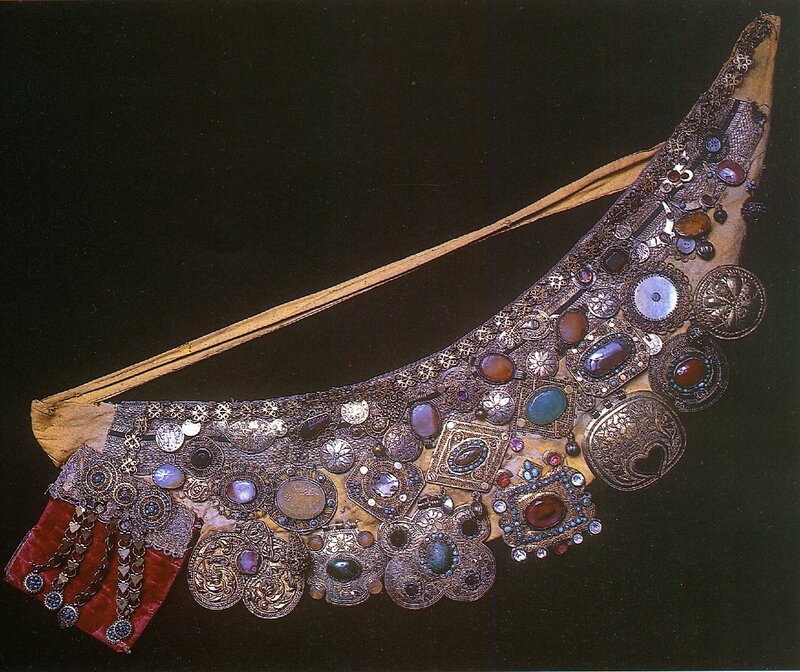 The second of the two ensembles above is shown with a piece of chest jewelry known as 'Khesite'. This is basically a bandolier of cloth covered with metal plaques and jewelry. 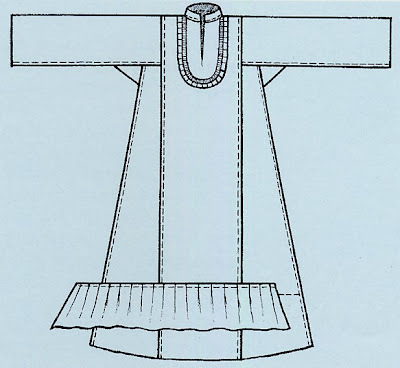 It hangs from the top of the left shoulder and under the right arm. [this may explain a confusing reference i ran across in an Uzbek book to 'underarm jewelry'] Here is a close view. 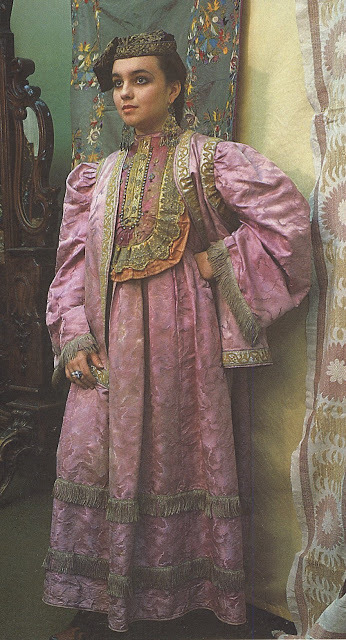 Here is a Tatar girl wearing a costume with the khesite. She has taken the kamzul off so we have a better view. These photographs are of old costumes, so the colors have faded. There is a third type of chest ornament known as 'Izyu', which is basically a plastron ruffle that covers the front of the garment. 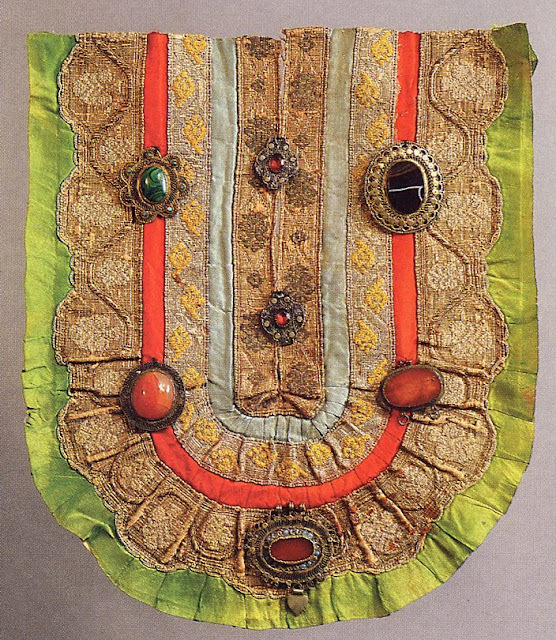 It often has what look rather like brooches sewn to the front of it. Here is a closeup of one. Here is a Tatar girl showing off her izyu. From what i can tell, each of these was usually worn by itself, but here is an exceptional photo of a Tatar girl wearing all three at once. This is obviously not peasant costume. These are the costumes of well-off townspeople. I will post more information on embroidery and peasant costume in a couple of forthcoming postings. Thank you all for reading. I hope you enjoyed this.